About a dozen years and a lifetime ago, I went to England by myself. I stayed in a B&B, wandered the museums and parks of London and rented a car for a drive through the Cotswolds. Driving on the left side of the road was an adjustment, but what was even more perplexing were the street signs. I was maybe a half-mile from the car rental place when I saw a sign with the charming if rather oblique message "Priorities Change Ahead." I wonder what that could mean, I thought. I was so caught up in my reverie that I nearly collided with a truck on my left whose driver clearly believed he had the right of way. Which he did. Because in England, "Priorities Change Ahead" means YIELD. I've been thinking about priorities a lot lately. Isaac is in his fourth month of Kindergarten, and while he's doing better--less perseverating, less anxiety--he doesn't have enough support to keep him engaged. He's not the kid who will disrupt class; he'll just go into his private zone. This worries me because while he's bright and tries hard, he needs almost constant support. It can be light pressure on his shoulder, a reminder to attend, or full hand-over-hand help. Without it he founders; with it he can flourish. His school is trying to accommodate his needs, and we are working with them. The head of the inclusion program is everything you'd ever hope for: she's warm, passionate and genuinely committed to Isaac's welfare. She's creative about finding solutions for his challenges in school. What she doesn't have: enough resources to meet the needs of the kids she works with. And honestly, creativity helps, but it only goes so far. The sad part? I realize how lucky we are, but it's still not enough. Yesterday we got a babysitter and went to a housewarming for some friends of ours. S. held Isaac on his first day home from the hospital; at that time she was dating her now-husband. Their toddler wobbled cheerfully across the floor as people ate, drank and caught up. Periodically there were screeches and wails: nursing children, Lincoln Logs knocked over, cookies removed from sticky fingers, naps postponed too long. It was lovely, chaotic and warm. I thought how nice it would have been to bring Isaac along. No one would have batted an eye, but it would have been too hard for him: the noise, the crowd, the jostling. And we would be distracted; worried about his anxiety level; unable to catch up with friends. Instead, he spent the afternoon happily climbing the monkey-bars at the playground. Was it the right choice? We'll be talking about this topic with him more and more in the coming months. In fact, our latest Gerald and Piggy book is called I'm Invited to a Party, which Isaac persists in calling "I'm Invaded to a Party" (under the circumstances, probably a more apt title). I wonder if we'll ever stop wondering whether to bring him along to parties or not; if it's healthy and right for him, or it's not fair: too loud, too busy, too, fast, too much. It's a lot to juggle and impossible to know what's right: when to rush into the unknown, and when, finally, just to yield. Late September, and birthday parties are back in bloom. We attended one about a month ago, and stayed a frantic and uncomfortable 20 minutes before Isaac insisted on leaving. But, optimasochists that we are, we thought we'd try this one: at Lemos Farm in Half Moon Bay, which, along with Train Town in Sonoma and Children's Fairyland in Oakland, is now one of our favorite places. So we thought we'd drive down Highway 1, stop at a farm stand on the way back, make a day of it. What could happen? When we got there, I quickly noted the presence of two bounce houses, those evil, billowing abodes of doom, and immediately flashed back to a birthday party three years ago when Isaac, still preverbal and terrified, wailed loudly until it was well out of sight and earshot. This time, he sauntered by and casually announced that he wanted to go in. Ha, I thought. Never happen. The photo is irrefutable proof that i was wrong, wrong, wrong. 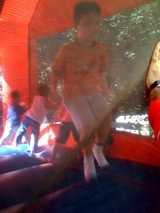 He did, in fact, go into the bounce house and bounce his little heart out. Not once, not twice, but three times, in three different bounce houses. They were loud, crowded and chaotic, but he didn't care. He bounced, and fell, and bounced again. My heart bounced a little too. "You have to try, right?" That's what my friend E. said as we fled her son's birthday party yesterday, after a few hurried bites of pizza, a few brief and disjointed conversations and about 30 minutes of wandering, fridge-opening and "I want to go home!!!" She understood, because she has a son on the spectrum, and because she is a very good friend. We'd spent the drive down trying to shush his full-throated tropical bird noises, not because they were quirky (we're waaay past that), but because they kept startling J., not exactly helpful while driving on a busy freeway. "EEEEEEEEEKK!" he'd yell from the back seat. "EEEEEEK!!!" And then, "I don't like people!! I don't like them!!! We finally caved and took him to Mickey D's, which, judging by the condition of Isaac stomach later that day, needs to do some serious soul-searching. And kitchen cleaning. It all culminated in a hurried bath, pancakes for dinner and a sleeping, damp-haired boy, two exhausted and cranky parents, and a home viewing of The Bourne Ultimatum, which seemed oddly soothing after such a fractured day. ...and it is okay--relaxing even--to have a day out with new friends. And you breathe a sigh of relief. And you try again, soon. I have a confession to make: we've never thrown a birthday party for Isaac. Oh, we had a family gathering in New York for his first, including the traditional taste of chocolate cake (he was not a fan, and I briefly wondered if somehow I'd been raising the wrong child). But a proper birthday party, with kids, and screaming and presents and goody bags? Not that. Not yet. It was between his first and second birthdays that the tornado hit--the not talking, the stimming, the missed developmental milestones. At night, I would curl up under the covers with What to Expect: The Toddler Years and read obsessively through the development charts, willing the columns to shift so that Isaac's spotty progress would seem less frightening. And then I'd put down the book and we'd have The Conversation: "Do you think it's more than a speech delay? You didn't speak in sentences until you were three. My cousins didn't speak until they were almost four. There's no way--he's too social/connected/happy/whatever. Do you think he is?" And on and on, over and over, for months. So the birthday thing: it's been a sore spot. But Isaac is going to be four this summer and I just can't imagine allowing my boy to have a childhood without birthday parties. So we're going to try it this year, in sort of a laissez-faire kind of way. We'll invite kids from his school, our friends with kids, and we'll do it at the playground, sans bouncy house. And if he refuses the cake, or ignores the other kids, or spends the whole time on the swings, we'll just have to deal. As he often does, he'll tell us what he needs, and as we often do, we'll find a rhythm, improvising with what we have, until the next time.